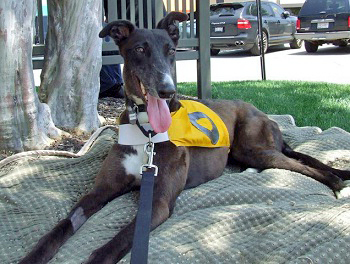 Dreamer, aka Worst Nightmare, is a 1½-year-old black female born on December 4, 2009. Her sire is Phenomenal Dream and her dam is KB's Sin City. 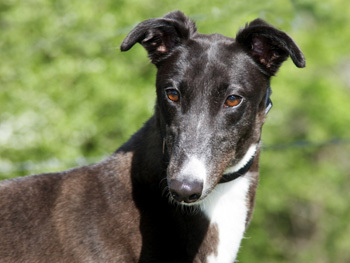 Dreamer has no races to her credit on Greyhound-data.com, chosing instead to embark early on the search for her forever home. 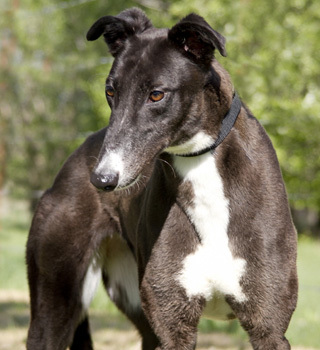 She has the same sire as Becky. Is this sweetie dreaming of your home? Dreamer's cat test: Dreamer wanted to repeatedly chase the cat beneath the bed - she is not destined to live with kitties. This petite girl is a little shy, but will melt your heart in just one look. Dreamer loves to have her tummy rubbed, and will flop right over so you can do so. She has a dainty little face, and a cute white spot by her nose. She likes to be right next to you, and loves to give kisses if you'll let her. Dreamer is just precious and sweet as sugar!